We made a presentation and gave a seminar of our product "Clinical Assignment Optimization Software" which is yet under development on Hospital Innovation Expo Japan. We recruited an engineering doctor researcher. We gave a demonstration exhibition of our product "Clinical Assignment Optimization Software" which is yet under development on "Nursing, Welfare, and Healthcare Business Fair" which took place at the 2nd floor of Resona Bank headquarters building underground. We made a presentation in the "Chushin Business Fair 2014" held in Kyoto Pulse Plaza, and we gave an introduction of our research and development service, and also gave an exhibition on our product of Super-Resolution Software "Ramiel". We displayed a panel exibition about our business service and product technologies in "KRP-WEEK 2014" held in Kyoto Research Park (KRP), and also made a presentation on our company introduction. We recruited an energy science master researcher. Our product plan of "Development of Bed Control Optimization Software using Multi-stage Clinical Pathway" was adopted by "Manufacturing, Commerce and Service Innovation Program for Medium and Small Size Company" of Compensation in Heisei 25 fiscal year. We made a poster presentation of "Development of Image Stack Analyzing Software" in "Bioimage Informatics Workshop 2014" which is held in Okazaki Conference Center of Okazaki-shi, Aichi. We recruited a medical doctor researcher. We made a presentation in "Kyoto Tanabe Business Fair 2013" held in Doshisha University Tatara Campus, and we gave an introduction of our product of Super-Resolution Software Ramiel and Non-linear Optimization Software. We made a presentation in the "Chushin Business Fair 2013" held in Kyoto Pulse Plaza, and we gave an introduction of our product of Super-Resolution Software Ramiel and Non-linear Optimization Software. We make a presentation in the KRP-WEEK 2013 held in Kyoto Research Park, and we performed exhibition for our product, service, and open innovation alliance examples. 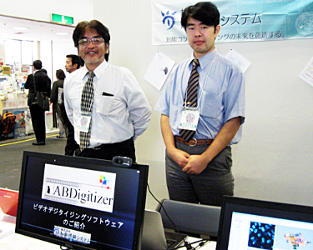 We make a presentation in the Neuro2013 (simultaneously held with Annual Meeting of Japan Neuroscience Society, Japanese Society for Neurochemistry, and Japanese Neural network Society), and we performed exhibition and a demonstration of our product TrackTaro, SpikeTaro, ABDigitizer, StackTaro and NGS Metagenomics AOI. We recruited an information system master researcher. Our software "Body Vital Function Bio-simulator E-learning Educational Tool" was adopted by Senshu Ikeda Bank for "Consortium Research and Development Grant" of Heisei 24 fiscal year. We recruited an information system postdoctoral researcher. We exhibited our products TrackTaro, SpikeTaro, ABDigitizer, StackTaro and NGS Metagenomics AOI on The 83rd Annual Meeting of The Zoological Society of Japan. We recruited a biotechnology postdoctoral researcher. 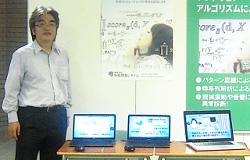 We made presentation on KRP-WEEK 2012 held in Kyoto Research Park, demonstrating our products TrackTaro, SpikeTaro, ABDigitizer and StackTaro. We performed product introduction and poster exhibition of "AOI Metagenomics" in the Convival Party with Researchers of Next Generation Sequencing, which has tanken place as a part of NGS on-the-spot Forum Second Workshop (Osaka). We sponsored The 74th National Convention of IPSJ (Information Processing Society of Japan) which has taken place in Nagoya Institute of Technology (Gokiso Campus). We recruited a Signal Analysis researcher. 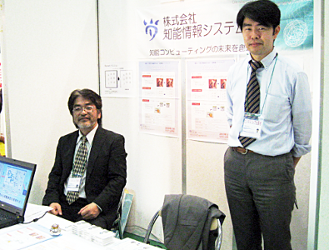 We sponsored Osaka Symposium on Digital Humanities 2011 which has taken place in Osaka University (Toyonaka Campus). 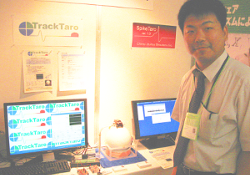 We exhibited our product "TrackTaro 1.0" and "SpikeTaro 1.0" in the KRP-WEEK which has taken place in Kyoto Research Park. We did presentation entitled "Human Memory Assistant Application implemented on Smartphone" in the joint discourse of Special Interest Group of Nonverbal Interface (SIGNOI) and Human Interface Society which was held in The Kyoto University of Industrial Arts and Textile Fibers. We started joint research and development with Research Institute for Microbial Diseases (RIMD), Osaka University about "Metagenomics Analysis Software for Next-Generation Sequencer". 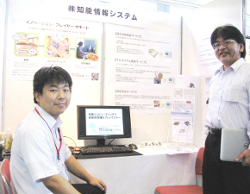 We made a presentation in the KRP District Exhibition 2010. On the interview of presentation, we demonstrated our new product TrackTaro. Joint research and development with Osaka University of "Cancer Image Diagnostics Assistance System" was adopted by METI (Ministry of Economy, Trade and Industry) of Japan, as Strategic Fundamental Technology Advancing Support Program. We sponsored The 73rd National Convention of IPSJ (Information Processing Society of Japan) which will take place in Tokyo Institute of Technology (Okayama Campus). We moved our office to Room 503 from Room 506-1 of ASTEM (Advanced Scientific Technology & Management Research Institute of KYOTO) for extending our office. 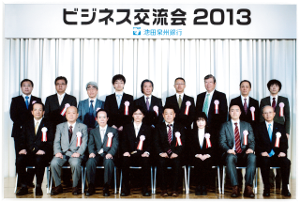 At this occasion, we will have a further effort to respond to the expectation of everybody. We recruited a Natural Language Processing researcher and a Life Science researcher. We became the supporter of IPSJ 50th Anniversary (The 72rd National Convention) which has taken place in University of Tokyo (Hongo Campus). We have participated in Interaction Festival with Postdocs, doctors and companies in Kansai, Japan which is sponsored by Career Support Center of Kyoto University. 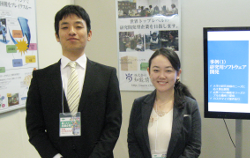 We participated in IT Business Industry Workshop at Venture Business Laboratory of Kyoto University. We published job offer public advertisement in Researchers Database JREC-IN . We recruited a Statistic researcher. We recruited a Biomedical researcher and a Mathematical Physics researcher. We have taken a discourse titled "Industry Application of Intelligent Computing" in the Workshop of Environmentally-Friendly Technology Development Support Society of Kyoto Industrial Association . We have participated in the Interaction Festival with Postdoctorals, Doctors and Companies which is sponsored by Career Support Center of Kyoto University. We sponsored The 71rd National Convention of IPSJ (Information Processing Society of Japan) which took place in Ritsumeikan University (Biwako-Kusatsu Campus). We moved our office to ASTEM (Advanced Scientific Technology & Management Research Institute of KYOTO) . We have recruited an Image Recognition researcher. which supports software developments of universities and research institutions. We have established our company to explore Intelligent Computing and create softwares of next generation. Please expect services that our company provide from here on. Statistic Analysis, Time Series Analysis, Signal Processing, Speech Processing, Natural Language Processing, Numerical Analysis, etc. I am studying everyday mathematical theories and system programming skills to produce state-of-the-art practical technologies based on intelligent computing. List of engineers is here. Spearate and clustering spike signals from multi-source neural signals. Promote and quicken your research greatly on neurophysiology ! Auto-detect positions from behavior experiments videos. Create trajectory chart and heat-map easily. No more manual labor ! This is a service to implement programs described under academic papers or articles of your researchers interest. This is a service to make modules and APIs of various even very abstruse algorithms you want. This is a service to develop software for academic researchers of any fields. Also performance tuning or extending existing software are possible. This is a service to do any works as consignment of a part of your research, such as survey papers and literatures, research system development, report writing, and so on. Contact and Inquiry is here. We developed an algorithm of face image recognition from cameras placed in real world environments.